TextPipe Lite - TextPipe is the ultimate Webmaster tool for updating text. It handles an unlimited number of files and folders, and is unique in handling files of unlimited size. It performs one or more changes AT THE SAME TIME, and can search for MULTI-LINE text..
TextPipe is the ultimate Webmaster tool for updating text. It handles an unlimited number of files and folders, and is unique in handling files of unlimited size. It performs one or more changes AT THE SAME TIME, and can search for MULTI-LINE text and special characters. Search for \'fuzzy\' text patterns using popular perl-style regular expressions, and friendly EasyPatterns, with predefined patterns for [Whitespace], [Date], [Time], [IPAddress], [EmailAddress] and more. 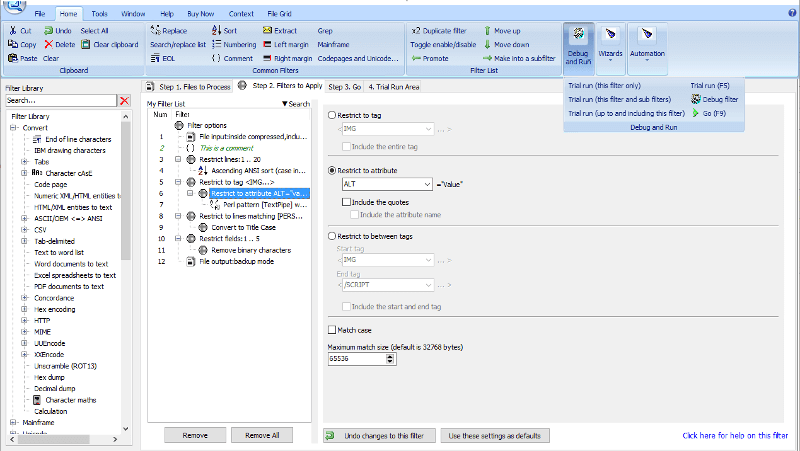 More than 200 example filter files are included along with a comprehensive online manual. Winner of SIA \"Best Application\" award. Pst Viewer Pro is a tool to help you view, search and convert email content, including Outlook .pst, Mbox, .ost, .msg and .eml files. Convert e-mails and attachments to PDF, CSV, MBOX, TIFF and many other formats. E-Mail filtering helps you discover important content. Reply/Forward to Emails. Supports bulk printing and export operations. Does not require MS Outlook. Try the world\' best Outlook Pst Viewer! Download a 15 day free trial today!